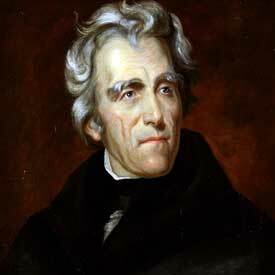 This year marks the 101st anniversary of Andrew Jackson rolling over and over in his grave. Back in 1915, the brand new Federal Reserve pasted the 7th President's likeness on its first $10 debt note – a sharp slap to the President who fought and won his famously bitter battle to destroy the “corrupting monster” of central banking. Old Hickory's 1836 victory held steady until 1913, when the bankers gathered in secret at Jekyll Island, Georgia to plot the greatest bank robbery in history. central banks and paper money. The scheme was simple. First, print all the money they wanted, backed only by government promises. Then, day by day, steal all the wealth it represented through built-in, unstoppable inflation. As more and more Federal Reserve debt coupons would litter the landscape, their value would shrivel to less and less. Since government always has first use of cash hot off the presses, only unsuspecting, taxpaying citizens would ever be financially harmed. Their crime-in-progress has now lasted longer than Andrew Jackson's victory to wipe them out, reducing the value of the 1913 dollar to maybe two cents over the past 103 years, as uncounted mega-trillions wash across the planet. But The Fed wasn't finished sticking it to Jackson. The hero of the last battle of the War of 1812, who killed a man in a duel after his wife was insulted, who survived the first attempted assassination of a sitting President (and then beat his hapless assailant senseless with a cane), would find his picture plastered on the $20 debt ticket in 1928, where it seemed destined to remain – until now. Replacing Jackson on Twenty-Dollar Bill? A recently announced substitution for Jackson discloses more than just another hilarious “inside joke” at The Fed. Harriet Tubman became famous escorting slaves along the Underground Railroad prior to the American Civil War. She was credited with guiding 70 families to their freedom. Like Jackson, she knew how to handle a pistol. She was also a self-admitted co-conspirator with abolitionist John Brown in the 1859 assault on the U.S. Armory at Harper's Ferry, Virginia, meant to spark a slave uprising. Six townspeople and one U.S. Marine were killed during the gun battle. Nine townspeople and a Marine were wounded. The first man shot to death by Brown and Tubman's insurgents was a railroad baggage handler, an unarmed black man who was not a slave. Tubman helped plan, finance, and recruit for the attack, but she wasn't there when the shooting started, for reasons debated but never explained. Tubman was not around when Brown and six of her other co-conspirators were tried, convicted, and hanged for murder and treason. Treasury Secretary Jack Lew's dubious decision to feature Tubman on the twenty (moving Jackson to the reverse) is an acknowledged, politically correct appeasement primarily to Hollywood and media politicos demanding women and civil rights figures on the currency. It was bankers and bureaucrats acting in their own political interests who took the most celebrated woman off coinage and currency in the first place. The allegorical Lady Liberty graced American coins from 1793 through 1947, and paper currency until the early 1900's, before being forgotten in favor of politically correct substitutions. It's already too late to feature the first named woman on circulating U.S. currency. Martha Washington, who donated her silver to mint the first American silver coins, graced the $1 Silver Certificate in 1886 and again in 1896 – when paper dollars were still a trusted substitute for sound money. Too late also to put the first civil rights heroine on U.S. money. Suffragette Susan B. Anthony's 1979 dollar coin was instantly despised, not to mention intrinsically worthless. “Susy B's” lasted three years before Washington figured out Americans wouldn't use them. That dollar coin would have been successful at the dawn of the stylish, swinging, entertaining Eighties had it been modeled after actress Susan Anton instead of Susan Anthony. This paper money is actually rising in value. A few months ago, Disneyland discontinued printing their popular Disney Dollars – corporate coupons used at theme parks. They feature historically significant figures like Mickey Mouse, Donald Duck, Goofy and other internationally famous cartoon icons. The surprise decision caught Disney fans unprepared. One currency dealer and avid collector tells us the market value of existing Disney Bucks is shooting sky high. Since Disney is no longer using Mickey and Goofy, or even gender inclusive Minnie Mouse and Daisy Duck on theme park cash, we suggest Treasury adopt Disney's images for all changes to U.S. currency. Fictional cartoon characters would represent America's central banking more faithfully than any whimsical fairy tale bureaucrats can invent. As existing Disney Dollars continue to zoom in value, putting Mickey and Goofy on U.S. currency would give that paper something it does not have now – instant intrinsic value – as collector items! Okay, we know opinions about pictures on money skirt the underlying issue – that paper is not backed by sound money. Gold was driven out of the American psyche when taken from circulation in 1933, and silver in 1964. Only a fraction of Americans alive today have ever seen a gold or silver coin, much less owned one. To acquaint modern Americans with sound money again, we encourage the Treasury to seriously consider another historic Disney character. That would be Scrooge McDuck, a champion of hard work, savings, and thrift, and usually portrayed playing in his vault, waist deep in physical gold and pure silver coins. Wouldn't matter to Andy Jackson. The President who called the central bank “subversive to liberty” would welcome any character who finally gets him off the paper money.